Tottenham Hotspur were left broken after a frustrating defeat to Manchester United which saw David de Gea steal the limelight. 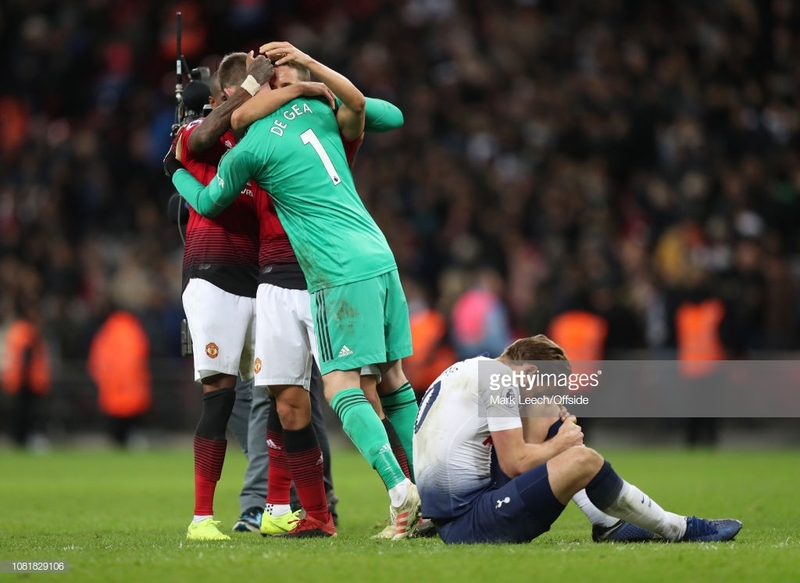 Manchester United prevailed in a 1-0 victory at Wembley Stadium over Tottenham Hotspur in one of the most entertaining matchups of the season. Marcus Rashford's goal just before the break proved the difference despite an onslaught of second-half Spurs attempts on goal. Ole Gunnar Solskjær's side are now joint on points with fifth-placed Arsenal and close the gap on Chelsea to just six points. Rashford's 44th-minute goal put the Red Devils ahead but it was David de Gea who won the visiting side the game with a total of 11 second-half saves. After an underwhelming first 45 minutes from Mauricio Pochettino's men some slight tweaks saw the Londoners dominate the remainder of the game but unable to find the equaliser. Spurs pushed to no prevail, the chances were there and on some occasions, their players should have done a lot better in their finishing. However, De Gea proved to be a human shield in between the United sticks. The Spaniard demonstrated the difference between the two sides through the use of his feet to prevent an equaliser. Hugo Lloris arguably should have done better in the goal-deciding goal and it is these fine margins which decide games amongst the heavyweights of the Premier League. Solskjær had clearly marked Tottenham's weak spots as their full-backs before the game as the first 45 minutes saw United exploit both Kieran Trippier and Ben Davies. With a front-three of Marcus Rashford, Jesse Lingard and Anthony Martial the pace of the United attack proved too much for Spurs to deal with. At times, Trippier and Davies found themselves deep in the United half but as soon as possession was turned over the away side used the wide space to put pressure on Toby Alderweireld and Jan Vertonghen. With three quick forwards running at them, the two Belgian centre-backs simply had too much to handle. And when Trippier gave away possession just before the break, United demonstrated the tactic and found the match-winning goal through Rashford attacking the open space on the right side of the pitch. David de Gea was excellent, however, Spurs' finishing was poor beyond belief. Harry Kane and Dele Alli both had golden chances to bring make Tottenham level but tame finishes allowed De Gea to prevent an equaliser. Finishes which we expect the likes of Kane put away yet the large majority of attempts on goal were low driven shots which the 28-year-old goalkeeper was able to get his foot onto. At times this season Spurs have proved ruthless - the back end of December a prime example after putting six past Everton and then five past Bournemouth. But on Sunday Spurs were not clinical enough and it has allowed fourth-placed Chelsea to close the gap on them to one point. Six points adrift of Liverpool, Spurs were labelled to be in the title race. Well, that is over. The Lilywhites now need to focus on retaining their Champions League position as we enter the business end of the season. Pochettino's men remain in the Carabao Cup, FA Cup and Champions League so the possibility of silverware is still on the cards. However, the title seems to have once again proved one step too far for the north Londoners and with Kane and Moussa Sissoko now added to their relentless injury list it is going to require maximum effort from Pochettino's men to maintain their third place spot.